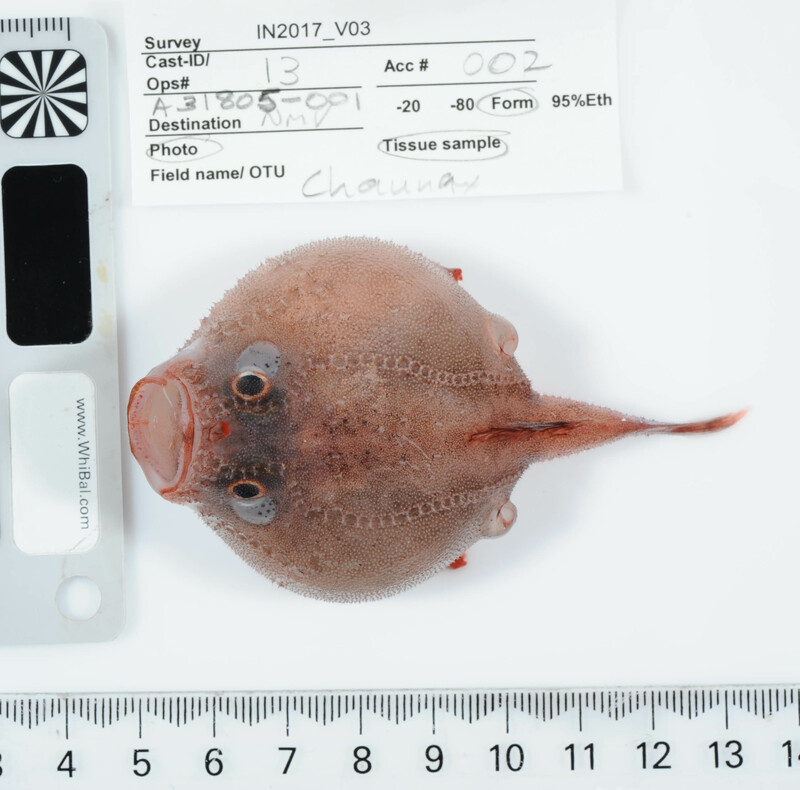 At first sight, faceless fish was recognised as being new to the Australian fish fauna. Image: Asher Flatt. What do you do after you’ve spent six hours hauling a faceless fish from an ocean abyss 4000 m deep? Well, according to the team from the Australian National Fish Collection (ANFC), the work has only just begun! Sampling the Abyss is a world-first survey to sample life in Australia’s eastern abyss. Led by Museums Victoria, the voyage on our research vessel Investigator includes scientists from seven countries, as well as two staff from our ANFC — John Pogonoski and Al Graham. Read the daily voyage blog here. When a haul of abyssal life lands on deck, our ANFC team springs into action — sorting, measuring, photographing, sampling and preserving, all part of the process to identify who’s who in the abyssal zoo. Both John and Al are clear about the importance of this voyage — the abyss is a habitat that has rarely been sampled in Australia and never has an Australian voyage been dedicated to this cause. The voyage is collecting specimens for scientific research, including taxonomy (naming, describing and classifying species) to discover and understand the species and their relationships to the previously documented abyssal fauna worldwide. 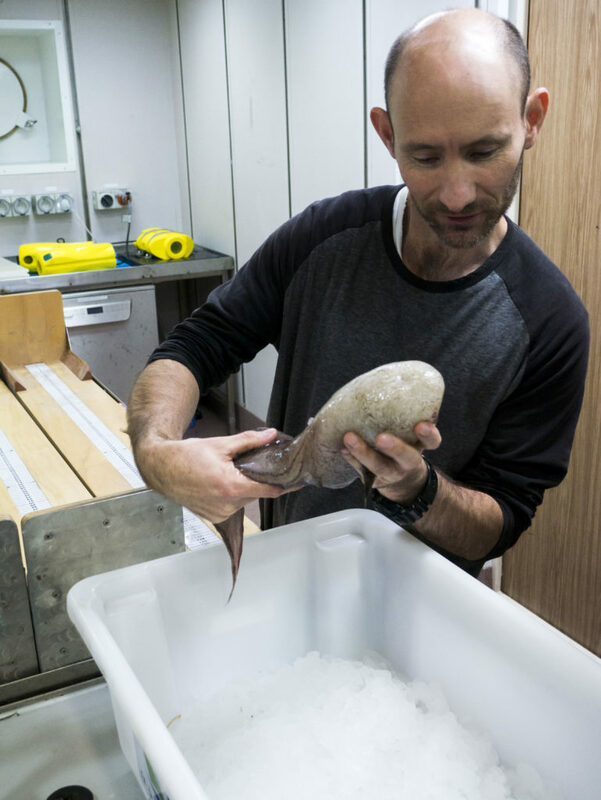 In one recent haul from the deep, our faceless fish appeared and it was only due to John — one of our ANFC Ichthylogists (fish scientist) — who pieced together the puzzle of a species never before recorded in Australian waters. As luck and a fair bit of hard work would have it, John had chanced upon an illustration of the species while working his way through various scientific publications. 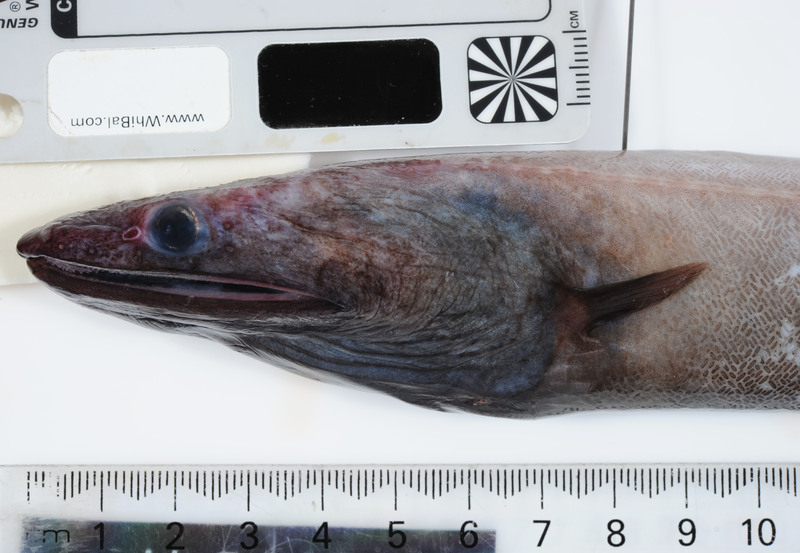 Our faceless friend is a type of cusk eel with the scientific name Typhlonus nasus. 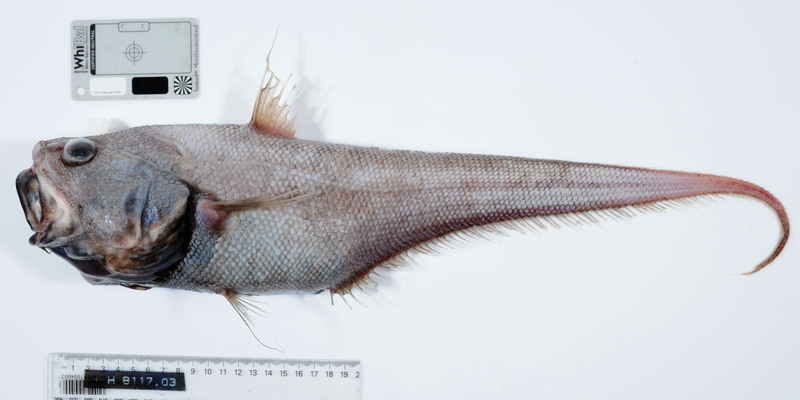 The genus name Typhlonus is derived from the Greek, typhlos, meaning blind, and onos, meaning a hake: the species name nasus means ‘large nose’ — a large nose blind hake! Other than our Facey McFaceless, what else have John and Al found? Here’s a gallery of their top 10 deep water finds of the voyage so far. 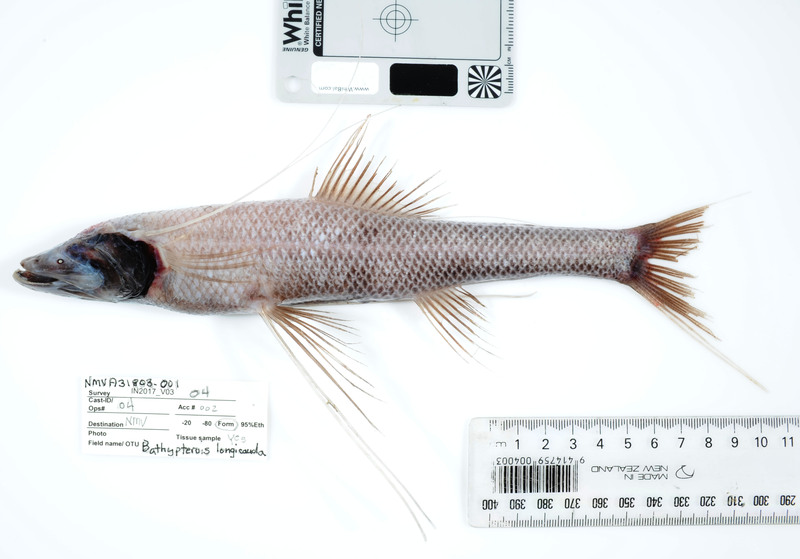 From the Australian National Fish Collection, CSIRO. Specimens collected on this voyage will end up in various institutions around the world, including the ANFC in Hobart, Tasmania. They will provide a vital resource and reference for Australia’s marine biodiversity, supporting research for sustainable management and conservation of healthy, diverse and productive marine ecosystems. These specimens will provide materials for study for many years to come, especially as a large number of rare and unusual finds have been made on this voyage. These studies will certainly include the naming of a number of new species. Since its foundation in 1943, the ANFC has grown to house more than 151,000 fish specimens representing some 3,400 species. Scientists from around the world visit this collection, and borrow material for examination. Soon, it may be welcoming a new faceless addition to the family! Find out more about our Australian National Fish Collection, and our Marine National Facility and RV Investigator. Estuaroums, litoroums, piscatoroums, & foroums as; a hope, for success, of/for fulfilled intrigueical, esoterical, romance upto; people, who metaphore, persons, as creatures, as other than, the anthropomorphs, they are. The only thing, i, did not like, about the movie, “Men In Black”, was that guy, Will Smith. Message from zeitgeist eavesore Dunstan. Into this life plenty of wholesome shareible clean valid safe humour should dwell. Message from 1 who believes the grass could be greener on the other side. Dios te bendiga.